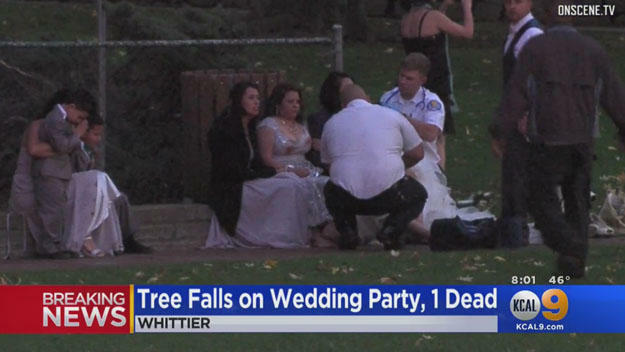 WHITTIER, Calif. -- Los Angeles County Fire Department officials say at least one person died and five others were injured after a large tree fell on a wedding party in the city of Whittier. One person at the scene was reported to be in cardiac arrest, CBS Los Angeles reports. It was unclear if that was the fatality. Initial reports said the fallen tree — a large eucalyptus — had trapped as many as 20 people beneath it. Injured gymnast pleads: "My pain is not your entertainment"
The incident happened around 4:30 p.m. at Penn Park. Officials said the party was taking pictures at the time the tree fell. At least two of the injuries were considered serious, officials said. The fatal victim was declared dead on scene. A witness tried to help the injured. She told CBS2/KCAL9 there was very little she could do without heavy equipment.